Representative Certified Tenobe Noodle Expert Nakabu Shoten Co., Ltd. 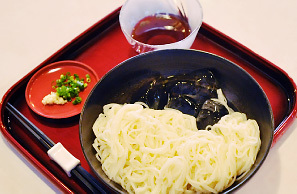 It takes two days to make somen, the Japanese version of vermicelli. Flour and salt are mixed and kneaded and the dough is gradually stretched to make the noodles thinner. The surface of the strands are coated with sesame oil. By the end of the first day, the noodles are about a centimeter thick. Nakabuan products fill the shelves of the shop beside the factory. Of course, the main product is tenobe somen. Some varieties are flavored with citrus or olive. 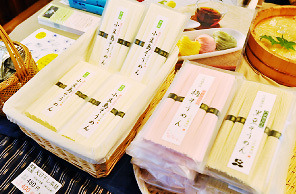 The latest product, fresh non-dried somen, is also very popular. The prices are slightly cheaper at this direct sales outlet. An infinite variety of noodles are produced around the world. Pasta, my personal favorite, is one type. Everyone says that the noodles special to Kagawa are udon but there is another type we mustn’t forget: Shodoshima somen. “Shodoshima is one of Japan’s three major somen production areas. We’ve been manufacturing somen on this island for 410 years,” says Yoshikage Nakabu, representative of a somen factory called Nobuan. “Shodoshima somen is noted for its chewiness, its sheen and the pleasant way it slides down the throat.” Mr. Nakabu goes on to tell me that to achieve the perfect texture, noodle makers must make fine adjustments to the amount of salt water, the kneading pressure and the maturation period depending on the temperature and humidity. No matter what the field, success depends on the skill and experience of outstanding craftsmen. 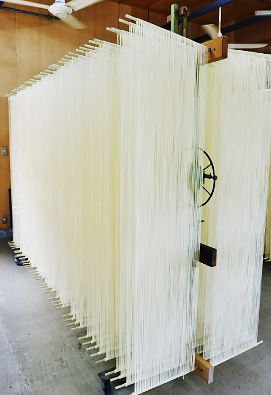 Somen that has been separated with chopsticks is hung to dry outside or in a drying room for five to six hours. The peak time for somen production is in the coldest part of the year. In winter, you can see somen flapping in the chill wind in many parts of Shodoshima. On the second day, the noodles are stretched to make them even thinner, separated with chopsticks, dried in the wind and cut. At Nakabuan, visitors can try separating the noodles with chopsticks. This is a great way to learn more about somen. The stretched noodles are hung on poles and chopsticks are used to separate them. The long sticks slide along the strands. It looks so easy when Mr. Nakabu does it. You have to work fast though because if the noodles dry out before you finish, they will snap as the chopsticks run between them. I was a bit tense at first, worried that I might snap the somen. It looks like there are many noodles hanging here but in fact it’s just one! After drying, it’s cut into 19 cm length noodles. One of the unique features of Shodoshima somen is the use of sesame oil to coat the noodles during the stretching process. This prevents the strands from sticking together or drying out too soon. “Sesame oil not only has a nice flavor but is also very resistant to oxidation. That preserves the flavor and quality of the somen.” Apparently, Shodoshima is the nation’s number one producer of sesame oil. This island really is blessed with food! I tried separating the strands with chopsticks, one of the final processes that stretches the noodles to the right thinness and prepares them for drying. After gently inserting a long pair of chopsticks between the strands, which are crossed and stuck together, you have to slide them firmly from side to side. This loosens up the strands and makes them extremely thin. It’s really quite fun! “Speed is important for this job,” Mr. Nakabu tells me. “If you take too long, the dough becomes dry and hard and doesn’t stretch.” I speed up a little. “That’s good. You’ve got the rhythm now.” As I continue, I’m thinking that I’ll put this up on Twitter! 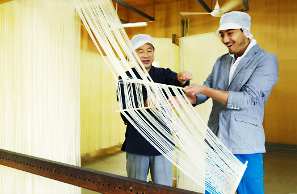 The separated somen is dried for about half a day in the sun. These curtains of thin white somen swaying in the breeze fit this tranquil island setting perfectly. This is fresh, non-dried somen, which you can only get at Nakabuan. The noodles are chewy despite being so thin. “It’s the chewy, almost jelly-like texture that makes them so good,” Mr. Takabu explained. Because it’s such a simple food, you can’t fake it with somen. They’re just boiled noodles but they’re so good! I can’t stop eating, which pleases Mr. Nakabu tremendously. At last, I get to taste the somen. This time, I’m going to try their latest product, fresh, non-dried somen. Normally, somen is completely dried but with fresh somen the surface is dried only enough to keep the strands from sticking together. Originally, this is what the noodle makers ate when they took a break. Wanting to share this uniquely delicious taste experience with his customers, Mr. Nakabu searched for ways to make it a viable product. It took him a whole decade! To be honest, I’m not at all familiar with somen. I prefer my pasta al dente and, as I opened my mouth to take a bite, I secretly wondered if I would like it at all. But oh! Buono! Mr. Nakabu has done a truly magnificent job. Instead of resigning himself to the way things are, he has discovered and developed a new way of enjoying somen. Even coming from the land of pasta, I was more than satisfied! It was so good I forgot my manners and asked if there were seconds. Characteristics: a firm, chewy noodle that slides smoothly down the throat. This texture results in a new taste sensation. But this delicious product can only be experienced at Nakabuan.